Extra large snakes are popular attractions in zoos from around the world. There are several large snake species to choose from but only a few are brightly colored although most of them are uniquely patterned. 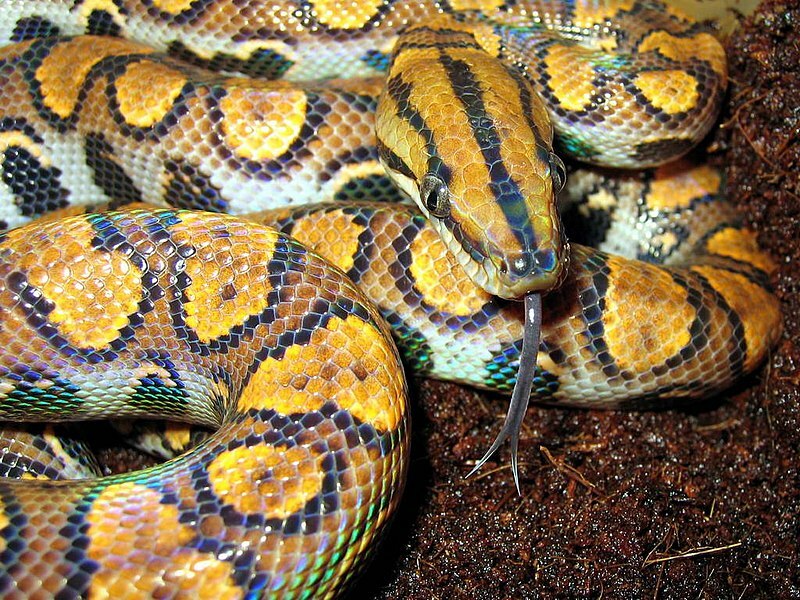 Here are the most colorful large snakes in the world for pet. The Albino Burmese Python is one of the most beautiful large snakes in the world. It is also one of the largest and native to Southeast Asia. It can grow to a length of up to 19 ft or 5.8 meters. The Brazilian Rainbow Boa is a large colorful snake native to Brazil. It was commonly name Brazilian Rainbow Boa for its vivid and bright coloration. This exotic pet is not advisable for beginners. Young specimens will often bite, but tend to calm down as they become more used to handling. Another very colorful large snake is the Peruvian Rainbow Boa of Peru in South America. The Green Tree Python is a large bright green snake with white spots. This beautiful snake is endemic to Indonesia and New Guinea and part of Australia. It can grow up to 200 cm or 6.6 ft in length. It feeds on small mammals, such as rodents, and sometimes reptiles. Macklot's Python is a non-venomous subspecies endemic to Indonesia. Prospective owners should remember that this huge snake has a reputation for being an irritable snake. It can grow up to Adults may grow to 7 feet or 213 cm in length or longer. This colorful snake breeds easily in captivity. Burmese Python grow fast. In a span of 1 year it could attain a length of 7 ft. It is often sold as pet and is made popular by its attractive color and apparently easy-going nature. This powerful snake also consumes large amount of food and due to its size it requires large, often custom-built, secure enclosure, which can be very expensive. The world’s longest snake and reptile, Python reticulates of Southeast Asia, is often kept as exotic pet for its beautiful markings or patterns. It can grow up to a length of 28 ft or 8.7 meters. This non-venomous snake is normally not considered dangerous to humans. Reticulated Python as a pet is not recommended to amateurs. Emereald Tree Boa, which resembles the Green Tree Python, is a large brightly colored snake often kept as an exotic pet. This non-venomous snake is native to South America and can grow up to 6 ft or 1.8 meters in length. It is distinguished from the Green Tree Python for its white irregular interrupted zigzag stripe or so-called 'lightning bolts' down the back and a yellow belly. It feeds mostly on small mammals, but they have been known to eat some smaller bird species as well as lizards and frogs. Although the common name of Python anchietae is Dwarf Angolan Python, this snake can grow up to 6 ft in length. It is native to Angola and Namibia in Africa. This reddish-brown bulky snake with yellow belly is a non-venomous one which is a rare species seldom seen in the wild or in captivity. It is the only known python to have "bead-like" scales and its diet consists of small mammals and birds. It was once one of the most expensive pet with a price of more than $20,000 USD. Today, it can be purchased for as little as $1,000. I would not consider having snakes as pets! Jun is quickly approaching and for most coastal regions the thought of a hurricane begins Cat and Cats creep into our minds. We become concerned about the safety of our homes, our pets and ourselves. The important thing is to have a plan and being prepared is the first step in making that plan. How to start working as a pet sitter? Do you love animals, have bags of experience with them, and are looking to build your income or even start your own small business? If so, then it might have crossed your mind to offer pet sitting services, such as dog walking, house sitting for people with Cat names, or feeding cats and small animals in their own homes while their owners are away.